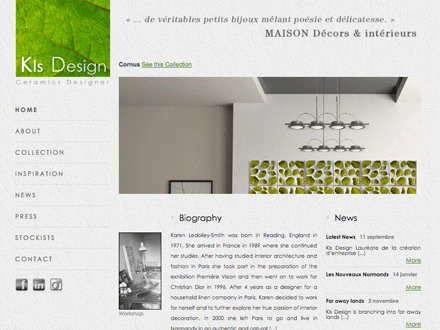 KLS Design was created by British designer Karen-Ledolley Smith who has been based in France for just over 25 years. Completing her interior architecture and fashion studies in Paris, Karen later worked for Christian Dior before taking the leap to set up her interior decoration business herself. Now settled in Normandy, France, KLS Design specializes in the creation of bespoke ceramic tiles using only natural materials. Greater online visibility to increase notoriety, stimulate interest and connect with new clients outside of Europe. Globeclic got on the case straight away. But here’s the catch. The project involved tweaking the already set up website and KLS Design insisted on keeping the dual English-French language interface under the same URL address and website. We got to work on adapting content, updating the language specific hreflang attribute to correspond language to country definitions. KLS Design’s project involved a thorough online visibility study of international Search Engine Optimization (SEO) that placed as much effort on updated content management as language integration. Result: In just under six months KLS Design was receiving new interest from countries such as Russia, the United States and Japan. Today KLS Design is showcased in Saudi Arabia and plans are currently underway to export to other countries in the Middle-East.